These DEWALT 12-in medium bar clamps are versatile and easy to use. There reinforced nylon bodies and heat treated steel bars are strong and durable. With 100-pounds of clamping force, 2-7/16" throat depth, and removable jaw pads to help reduce marring, these clamps are Guaranteed Tough. The BORA WTX clamp edge saw guide is the perfect addition to your circular saw, router or jig saw. Made out of heavy gauge, extruded aluminum, the WTX clamp edge is tough and durable. The adjustable end clamp slides easily along the channels, eliminating the need for the internal channel bar. The locking handle grabs work surfaces and won't let go, giving you a secure edge that won't budge. Allowing you to make precise track saw like cuts with a circular saw, jig saw or router. The WTX clamp edge is 50 inch. long and with the connector accessories you can add an additional 50 inch. of cutting capacity. The handle is molded with a hanging notch for convenient storage while it's not in use. You can adjust the cut with our Dado guide for a perfect, snug cut every time. The BORA Router Dado Guide comes with a 1 inch. porter cable bushing for easy mounting. Make your workshop or garage even more versatile with this exceptional router dado guide and saw guide duo. 12-Inch. 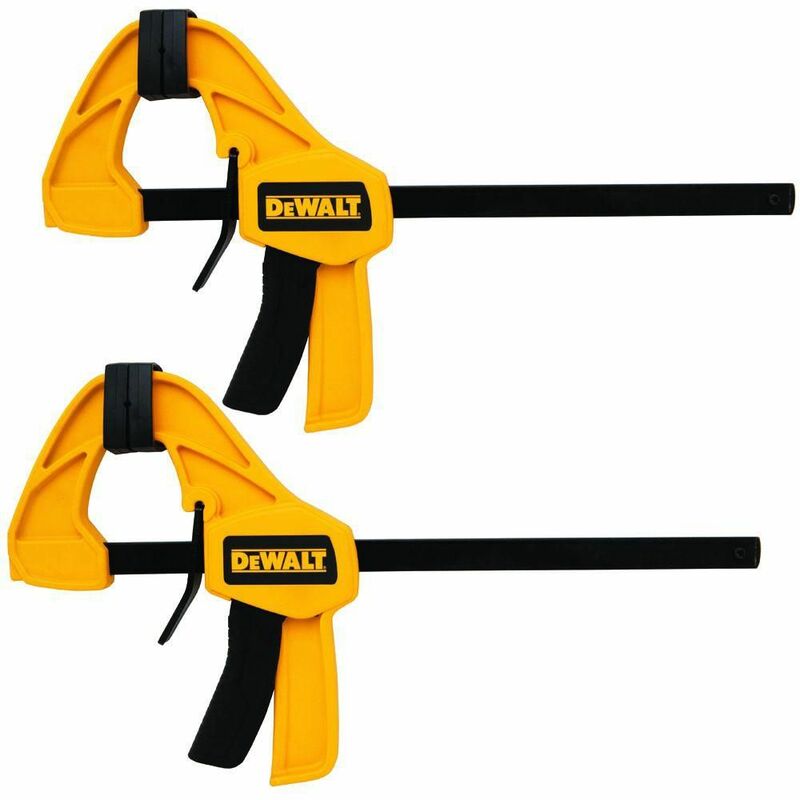 Medium Trigger Clamp (2-Pack) These DEWALT 12-in medium bar clamps are versatile and easy to use. There reinforced nylon bodies and heat treated steel bars are strong and durable. With 100-pounds of clamping force, 2-7/16" throat depth, and removable jaw pads to help reduce marring, these clamps are Guaranteed Tough. 12-Inch. Medium Trigger Clamp (2-Pack) is rated 4.6 out of 5 by 26. Rated 5 out of 5 by Wil from For my application, the smaller size of these clamps were... For my application, the smaller size of these clamps were perfect for assembly of parts for fastening. Rated 5 out of 5 by Jim from we used these and they did a great job.... we used these and they did a great job. Rated 5 out of 5 by Nacho from Had and Irwin clamp holding a 2 x 4 when it came off the sawhorse and boom just like that it was ... Had and Irwin clamp holding a 2 x 4 when it came off the sawhorse and boom just like that it was broken. Next day I happen to be at Home Depot and they these guys on sale! I picked them up to replace the broken one and they are just as handy and easy to use. The big difference I can see is the 'name'. They work great. Rated 5 out of 5 by Jack from They worked great. They worked great. Rated 5 out of 5 by Shask from Really like these don't slip like my old ones. Really like these don't slip like my old ones.